I’m not a Superman fan. I don’t read any Superman titles. I’m not in tears over Smallville’s last season, and Henry Cavill’s recent casting as the Man of Steel doesn’t make my heart race. I tend to side with the argument that Superman is … just … boring. Utterly vanilla. I’ve never been hugely taken in by any Superman story I’ve read—he just doesn’t do anything for me. And in truth, I’ve probably never given him much of a shot. But that’s because right now, I love Superboy. This is a fairly recent development. As I’ve never particularly followed the Teen Titans, my exposure to Conner Kent has been sparse at best. I knew he was a clone. I knew he dated Wonder Girl. And I knew that he died during a Crisis. That’s about it. And now that I think about it, I don’t even know how or when he returned. Such as it is, I’m not sure what prompted me to pick up the new Superboy series by Jeff Lemire and Pier Gallo. I suppose a part of it was Rafael Albuquerque’s gorgeous front cover to the first issue. Nothing set the tone of this book better than that healthy image of a smiling Superboy, and the feeling only gets better when you crack this thing open. You’re sitting in a rocking chair on a wrap-around porch with a glass of lemonade and the sun shining around you. Oh, and there’s Krypto barking by your lap. The best way I can describe what Lemire is doing here is by using the phrase “old-timey.” We’re bringing back what was once good and what the Superman franchise was built upon to begin with—the “clean.” It’s clean in foundation, in moral, in outlook, in artwork. It’s upbeat. It’s the Kents on a farm in a small town. It’s a young kid with his buddy and his dog… and then it’s also something else. Superheroes and bad guys. Back to basics, but it works spectacularly well. The title’s first story arc is set off by a foreboding appearance from the Phantom Stranger and followed by an attack from Parasite, but it’s peppered with quiet moments and heart-warming character exchanges. And yet, it still surprises you. It’s almost a book of contradictions, as that classic style and air will switch on you and give way to something you didn’t expect. Parasite, for instance, is followed up by Poison Ivy. Psionic Lad’s wholesome appearance in one issue is trailed by … well, I can’t tell you. You’ll just have to read it. 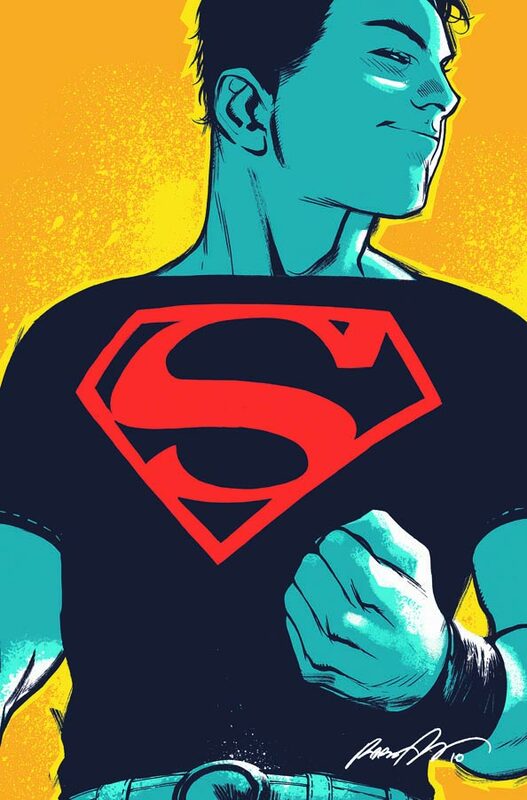 Lemire’s Superboy struggles with his place in the world, his relationships with his friends, and his own identity to an extent. It’s all capped off with a few pieces of campy dialogue here and there—not enough to turn you off the book, but rather just deliberate and delicate enough to flavor it with a—let’s call it “vintage”—writing sensibility, giving the book a traditional feel. The art offers a fresh-faced look with clean lines, decent camera movement, and wonderful colors. Most of us didn’t grow up with the Superman of old. While I have a few minor complaints (Lori’s ridiculous outfits, for one), this, to me, offers its readers exactly what the phrase “of old” could have felt like, and Lemire’s only just getting started. My little crush on this book hasn’t prompted me to pick up Superman: Earth One or any issues of Action Comics. But who knows if it will get me there eventually. Maybe one day, thanks to the incessant pestering of my comic shop people, I will give the Man of Steel a fairer chance. But right now, I’m ready for the upcoming Superboy/Kid Flash race. It is, apparently, the first ever. This entry was posted on 02/25/2011 by ravenhaired. It was filed under Comic books, Reviews and was tagged with DC, Jeff Lemire, Superboy, Superman. You realize that thinking that Superman is plain and boring makes you a hypocrite for having a problem with the people who thought the same a Wonder Woman? I can’t believe you’d call me out like that. :-O Hahaa. Sigh, it’s true. I don’t know. Whenever Supes is in something I’m reading, I just don’t feel anything for him. He honestly doesn’t stir anything in me at all. If others give Wondy a shot and feel the same, then I guess she’s just not for them. But I think she’s too often misjudged based on appearance/horribly outdated tales, rather than substance, so I think most readers get the wrong idea.